I’m going to be a speaker at the Mother Earth News Fair in Seven Springs, Pennsylvania on September 21-23, 2012. 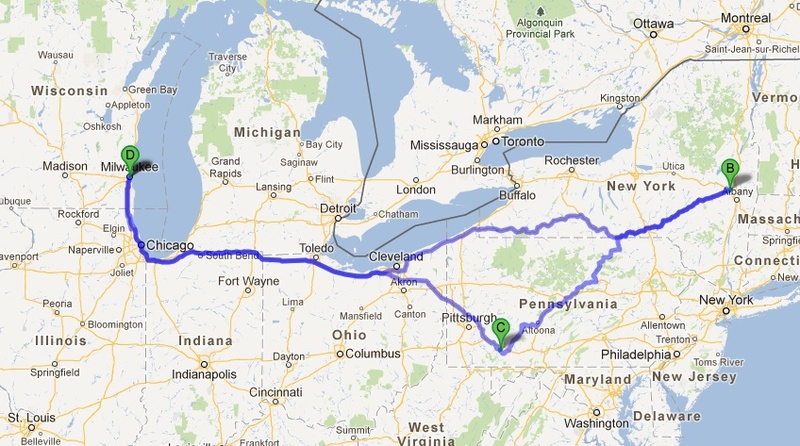 My wife has relatives in NY State, so we are going to attempt a ROAD-TRIP with a Two-Year-Old! We’ll be traveling from Milwaukee to Schenectady, NY, spend a few days there, showing the Little Girl to her Great-Grandmother, and then use Thursday Sept. 20th to travel from NY State to Seven Springs, PA.
We’ll be driving the red gen 2 Hymotion Prius on the trip, and will try to have it shown off at the Clean Car Show at the Mother Earth Fair at least one day. If you are somewhere on my route, and want to meet up, let me know! I’d be happy to talk electric vehicles, DIY culture, and anything else, in exchange for home cooking, and a 15-amp electric outlet. We’ll just be taking the most direct freeway route, but I’ll have a GPS Smart phone with, so I can check in on the road, and have enough time to get just a little sidetracked. Previous post: Jack Daniels / Boo Hoo!